Some young children are able to create stunningly realistic drawings resembling those of adult artists. Does this kind of ‘super’ drawing ability foretell a future adult artist? Here different kinds of exceptional child artists are examined, leading to the suggestion of six characteristics that are likely to be predictive of becoming an artist. Some children are able to create stunningly realistic drawings at a young age without having ever taken drawing lessons. Figure 1 shows a drawing created by Reese at age 5 years 5 months and shows occlusion, detail and fluid movement. Figure 2 shows a drawing created by Kai at age 3 years 9 months that shows figures in motion and interacting with their eyes. Most adults cannot draw nearly as realistically as these ‘super’ child artists, whom we refer to as ‘precocious realists’. Does this kind of precocity foretell a future adult artist? It is tempting to assume that the earliest sign of artistic talent in young children is the ability to capture the three-dimensional world realistically on a two-dimensional surface (Milbrath, 1998; Winner, 1996; Winner & Martino, 2000). Art historians have been struck by the realism of the cave paintings by our Paleolithic ancestors (Humphrey, 1988; Pruvost et al., 2011), leading many to assume that realism is the most ‘natural’ and universal form of drawing. We tend to assume that the greater the skill in realistic drawing, and the earlier the skill emerges, the more likely such a child is to become an artist. But not all artists drew as realistically as Reese when they were his age (Gordon, 2011). Thus, level of realism as a child may not be sufficient to predict future artistry. Retrospective examination of the childhood works of adult artists has now given us a few clues to predict who will become an artist. Along with realism, we suspect that five other characteristics are important early signs: the child’s drawings are well composed; the drawings have something more than realistic skill – either a decorative, colourful aspect or expressive power (note the playfulness of Reese’s drawing in Figure 1); the child has a hunger to look at art; the child possesses an enormous drive; the child shows a strong desire to be original. Let’s look more closely at this tiny majority of super children (including some with autism) who draw so realistically. Precocious realists begin to draw representationally by age two, and this is at least one year in advance of typical children. Figure 3 contrasts a precocious and an age typical attempt at drawing apples, both drawn at age 2 years 2 months. The age-typical drawing shows a slash for each apple, with line standing for ‘thingness’; the precocious drawing uses line to capture the contour of the apple. Figure 4 contrasts two figure drawings by three-year-olds, one precocious and one age typical. The typical drawing is called a ‘tadpole’ representation of the human figure, with arms and legs protruding from the head; the precocious drawing, by Grace, differentiates the body into head, torso and legs, and shows motion (note the attempt to show the woman’s leg kicking up). Typical children’s drawings at this early age are abstractions: the representation of an apple as a slash and the human body as a circle. In contrast, precocious realists’ drawings are less abstract, and more optically realistic – similar to the naturalism of cave paintings. Precocious realists discover on their own how to create the illusion of three-dimensionality using pictorial depth cues – foreshortening, occlusion, size diminution, modelling to show volume, and even the most difficult technique of all, linear perspective – and they do so years before typical children (Milbrath, 1995). For instance, foreshortening was used in 50 per cent of the drawings by Milbrath’s precocious sample by age 7 and 8; comparable levels in the typical sample were reached only by ages 13 and 14. Typically children in the West do not begin to draw in perspective until middle childhood, and only those who have explicit instruction ever attain true geometric perspective (Willats, 1977). Some precocious realists seem more interested in understanding nature than in drawing per se: drawing is simply their tool. We studied two children like this. Both pore over nature encyclopedias and field guides. Rocco (currently seven years old) is passionate about insects, seeds, leaves and vegetables. He collects specimens and draws and labels each one. Figure 5 shows Rocco’s drawing of one of the bugs he collected. Joel (currently 13 years old) has memorised the Kaufman Field Guide to Birds of North America and makes meticulous copies of these drawings, for example as shown in Figure 6. These children appear to be using drawing in the service of understanding about nature, and are perhaps more likely to become scientists than artists. The ability to draw realistically at a precocious age also marks the childhoods of those who have gone on to become recognised artists. Gordon (1987; 2011) studied the childhood works of 31 Israeli artists and found that each showed an ability to draw realistically, though as mentioned there was variability in the level of realism achieved. Sloane and Sosniak (1985) interviewed 20 sculptors and found that most recalled drawing realistically at a very early age. Many other famous artists’ early drawings have been singled out for their advanced realism: for example, Millais (Paine, 1981), Landseer (Goldsmith & Feldman, 1989), Sargent (Cox, 1992), and Klee, Picasso and Lautrec (Paine 1987; Pariser, 1987, 1991). 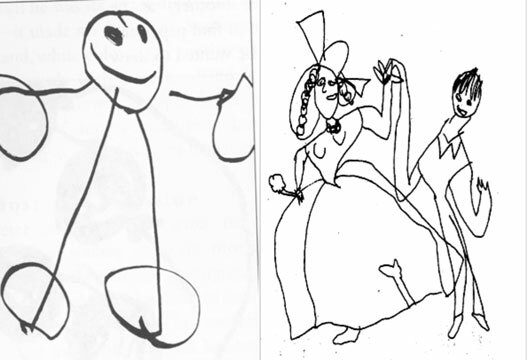 Children with precocious drawing ability are not just advanced, they are also different. These children seem to just see the shapes of things, including the distortions of shapes as they recede into depth and diminish in size or become foreshortened. While some of these children have high IQs, overall we have found no relationship between realistic drawing skill and IQ (Drake et al., 2010). The independence of drawing skill from IQ can also be seen in the striking realistic drawing capacities of autistic ‘savants’ with low IQs such as Nadia (Selfe, 1977) and Stephen Wiltshire (Wiltshire & Sacks, 1991). We find that what distinguishes children who draw realistically at an above- average level is not having a high IQ, but instead having exceptional perceptual skills (Drake et al., 2010). Realistic drawing skill is strongly associated with the use of a superior local processing style (focusing on the parts on a visual display). We administered a version of the Block Design Task once in traditional format, and once with the blocks segmented in space from one another, making it easier to copy the designs with actual blocks. While typical children were helped by presentation of the task in segmented form, since the segmentation reveals each part (or segment) of the design to be reproduced with blocks, precocious realists benefited less from this external segmentation, presumably because they were able mentally to segment a complex form into its parts. The precocious realists also outperformed typical drawers in the ability to detect small shapes hidden within complex figures – a task requiring a kind of analysis of a form into its parts. The local processing perceptual style seen in precocious realists is related to the local, part-by-part strategy used when they draw, building up the drawing bit by bit. We observed these children copying complex drawings of non-objects not by first sketching in the global outline and then modifying this, but rather by building up their drawings detail-by-detail, part by part. This is only possible if one has analysed the observed model into its parts and can also keep an image of the to-be-completed whole in mind. Previous research has attributed this superior local processing style specifically to autistic children. For example, Shah and Frith (1993) showed that autistic children benefit less from presentation of the Block Design Test in segmented form than do non-autistic children. Our research has shown, however, that superior local processing is predicted not by presence or absence of autism but by the ability to draw realistically (Drake, 2013). Previous research examining local processing in autistic populations did not control for level of drawing skill. If there is a disproportionately high incidence of precocious realism in autistic children, this could account for why superior local processing has been thought to be exclusive to children with autism. While most Western children identified as gifted in drawing have come to our attention by virtue of their precocious realism, some children show precocity in the ability to master a non-realistic style. Golomb (1991) described these children, whom she called ‘colorists’, as showing an awareness of artistic form and quality, and a concern with decorative and expressive aspects of colour, texture and design. Gordon describes two types of artistically gifted children – ‘those who excel in representing reality, and those who create non-realistic, expressionistic works’ (Gordon, 2011, p.6). Alexandra Nechita exemplifies gifted artistry without realism: she painted large canvases in the style of Picasso from a young age, showing her ability to capture a modernist, non-realistic, but still representational style (Nechita, 1996). Is it possible to display artistic giftedness when creating entirely non-representational images? Parents (at least Western ones) sometimes believe that their typical two-year-old is a prodigy because they notice the similarity of a two-year old’s painting to that of an abstract expressionist master. Gallery owners have been fooled by such paintings, thinking they were by adult artists – as in the case of Aelita Andre. Because these works are age typical, we cannot call their makers artistically gifted – even if we find the paintings pleasing and at least superficially similar to works by abstract expressionists. The film My Kid Could Paint That, by Amir Bar-Lev, explores the possibility that parents and gallery owners are fooling the public into thinking these works are actually signs of genius. We have recently discovered a child whom we would classify as artistically gifted whose paintings are entirely non-representational, but are also very different from those of the typical preschool child – both in product and process. Several months shy of his second birthday, Arrian began to create colourful completely abstract drawings on large pages (18? x 24?) using Crayola colour markers, concentrating intensely (Figure 7). He typically works on each drawing for a day and a half to two days. He fills the entire space densely and meticulously with controlled movements. The systematicity, intensity and focus of Arrian’s process, and the meticulous care with which he fills in the entire page, sets him apart from the typical two-year-old scribbler. None of the precocious realists we have studied showed anything like Arrian’s behaviour – they progressed rapidly to representational drawings and showed no interest in non-representational art. Arrian draws constantly and compulsively, as do the precocious realists we have studied. This kind of ‘rage to master’ cannot be taught. One cannot even cajole or force a normal child to draw for hours. The children we study often have to be dragged away from their preferred activities in order to eat, sleep, go to school and be sociable. The interest, drive, and desire to work on something must be part and parcel of the talent. The desire to work so hard at something comes from within, not without, and occurs almost always when there is an ability to achieve at high levels with relative ease. The majority of gifted child artists do not become artists as adults (Winner, 1996). Even astounding realistic drawing skill is not sufficient to predict becoming an artist. Fineberg (2006) notes that Picasso’s drawing of Hercules (drawn at age 9, the earliest drawing we have by Picasso) is ‘unremarkable’, and suggests that even more important than realistic drawing skill is the ability to create an interesting story in a picture. Thus, early skill in realistic drawing may be neither necessary nor sufficient for becoming a great artist. Paul Klee’s childhood drawings were far less realistic than those of Picasso (Gordon, 2011; Pariser, 1987, 1991), yet both are among the greats. Nor is the age at which extreme realism emerges predictive: Klee’s drawings at age 6 were less realistic than those of some of the children whose work is reprinted in this article, and yet he became a major painter (Gordon, 2011). The retrospective evidence presented by Gordon (2011) leads us to hypothesise that realistic drawing skill, no matter how strong and how early it emerges, cannot be sufficient for future artistry. As mentioned at the outset of this article, along with realistic skill, five other factors are likely to be predictive of becoming an artist: (1) the child’s drawings have interesting, arresting compositions; (2) the child’s drawings have decorative, aesthetic features and/or expressive power; (3) the child shows a hunger to look at art (whether in museums or books), and hence a deep interest in art; (4) the child has enormous drive – a rage to master; and finally, and perhaps most importantly, (5) the child has a desire not just to make excellent art, but to be original, innovative, new. We don’t even know whether such skill is necessary to become an artist today, when realism is not prized. It would be important to unearth the childhood drawings of a large sample of today’s abstract and conceptual artists as a way to begin to answer this question. We don’t know whether children who show no precocious realism but who are obsessed with form and colour like Arrian ever become artists because so few of these non-realistic child prodigies have been identified, and none have been followed into adulthood. On the one hand, many artists began to draw as precocious realists, as pointed out earlier, suggesting that it is the realists who are more likely to become artists. Yet it may be that children who paint abstractly are more unconventional and playful, thinking out of the box, and thus perhaps more likely than the realists to think like artists. As E.H. Gombrich reminds us in Art and Illusion (1960), realistic art is only one thin slice of the art that humans have produced over the centuries. Perhaps there is more than one route to gifted artistic production – one via a striving towards realism, and another via non-representational exploration of form and colour. Drake, J.E. (2013). Is superior local processing in the visuo-spatial domain a function of drawing talent rather than autism spectrum disorder? Psychology of Aesthetics, Creativity, and the Arts, 7, 203–209. Drake, J.E., Redash, A., Coleman, K. et al. (2010). ‘Autistic’ local processing bias also found in children gifted in realistic drawing. Journal of Autism and Developmental Disorders, 40, 762–773. Fineberg, J. (Ed.) (2006). When we were young: New perspectives on the art of the child. Berkeley, CA: University of California Press. Goldsmith, L. & Feldman, D. (1989). Wang Yani: Gifts well given. In W.C. Ho (Ed.) Wang Yani: The brush of innocence (pp.59–62). New York: Hudson Hills. Golomb, C. (1991). The child’s creation of a pictorial world. Berkeley, CA: University of California Press. Gombrich, E.H. (1960). Art and illusion. London: Phaidon. Gordon, A. (1987). Childhood works of artists. The Israel Museum Journal, 6, 75–82. Gordon, A. (2011). The childhood works of artists. Unpublished book manuscript. Humphrey, N. (1988). Cave art, autism, and the evolution of the human mind. Cambridge Archeological Journal, 8(2),165–191. Milbrath, C. (1995). Germinal motifs in the work of a gifted child artist. In C. Golomb (Ed.) The development of artistically gifted children: Selected case studies (pp.101–134). Hillsdale, NJ: Lawrence Erlbaum Associates. Milbrath, C. (1998). Patterns of artistic development. New York: Cambridge University Press. Nechita, A. (1996). Outside the lines. Atlanta: Longstreet Press. Paine, S. (1981). Six children draw. London: Academic Press. Paine, S. (1987). The childhood and adolescent drawings of Henri de Toulouse-Lautrec (1864–1901): Drawings from 6 to 18 years. Journal of Art and Design, 6, 297–312. Pariser, D. (1987). The juvenile drawings of Klee, Toulouse-Lautrec and Picasso. Visual Arts Research, 13, 53–67. Pariser, D. (1991). Normal and unusual aspects of juvenile artistic development in Klee, Lautrec, and Picasso. Creativity Research Journal, 4, 51–65. Pruvost, M., Bellone, R., Benecke, N. et al. (2011). Genotypes of predomestic horses match phenotypes painted in Paleolithic works of cave art. Proceedings of the National Academy of Sciences, 108, 18626–18630. Selfe, L. (1977). Nadia: A case of extraordinary drawing ability in an autistic child. New York: Academic Press. Sloane, K.D. & Sosniak, L.A. (1985). The development of accomplished sculptors. In B.S. Bloom (Ed.) Developing talent in young people (pp.90–138). New York: Ballantine Books.